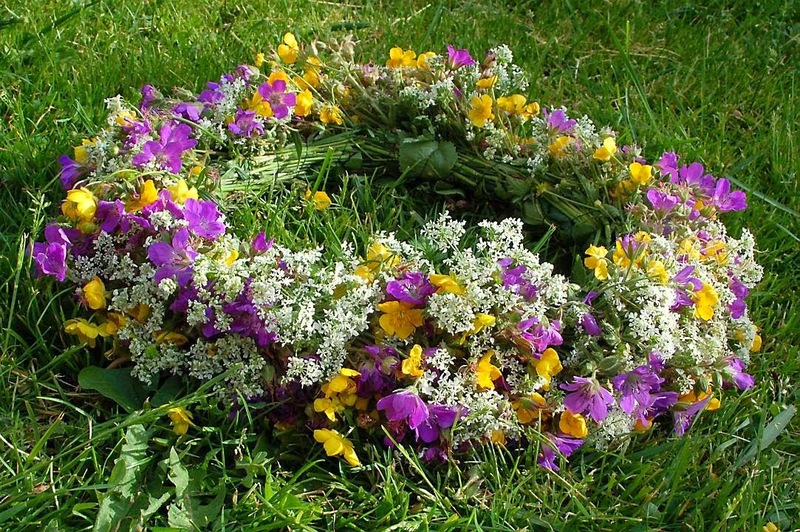 Today is a big deal for Swedish people; we celebrate the summer solstice. It's done all over the country, but I believe people in my area have taken it to heart the most. People actually travel from other parts of the country to Dalarna to experience a "genuine" midsummer. That doesn't sound like a big deal, because Sweden is rather small, right? It's true if you measure on population, we're just some nine million people. If you measure on area, Sweden is the third largest country in the European Union. It is approximately 978 miles from north to south, and Dalarna is just south of the middle. In Sweden, the summer solstice always happens on a Friday. This was decided in the 1950s, because we lost too much productivity closing everything down for days if Midsummer happened to be on some other weekday. This way businesses are only closed for one day, and people can celebrate Friday and Saturday, and recuperate on Sunday. To celebrate properly, you're supposed to pick flowers and make a "midsommarkrans" that you put on your head. Every village with any sense of pride has a "midsommarstång" and this is sort of a flag pole clad with flowers and greenery that is raised at a central spot. Many households put up a little one in their yard, some villages have a smaller one, and some have huge ones. It becomes very heavy, and the raising is a big ceremony. I would love to put one in my yard here in Florida, just to see if people would react, but we don't have the right kinds of greenery and flowers here, so it wouldn't be the same. LOL. 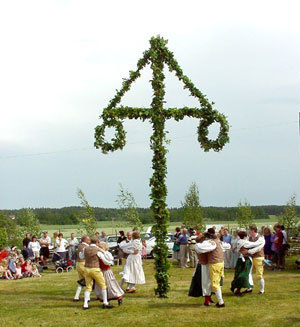 Anyway, once the midsommarstång is up, dancing commences. There will also be big cook-outs, fancy dinners, and lots of drinking all around the country. We believe that Midsummer is the time when the veil between worlds is the thinnest. You're supposed to pick seven kinds of flowers and put under your pillow - which kinds of flowers depends on who you ask - to dream of your true love. If you're lucky, you might see fairies dance on the meadows, but if you walk in the woods and hear someone play violin you'd better watch out. That might be Näcken. He sits naked in a stream playing his violin, hoping to lure maidens in the water so he can grab them and take them to the underworld.